I spent yesterday morning wandering around The Metropolitan Museum of Art with my friend, Stacy. It was quiet when we arrived so we were able to stroll about at our leisure and enjoy all the exhibits without the normal crowds. We thought the Madame Cezanne exhibit interesting but really depressing. She looks so sad in the paintings (with the exception of a few sketches Cezanne captured of her in their early years together). We speculated about what it must have been like to sit for painting after painting. I was much struck by one description that said that she & Cezanne married for the purpose of legitimizing their son. Did he paint her over and over again because he loved her? Or only because he liked to paint what he was familiar with? We were wowed to learn about “The Treatment of Tullio Lombardo’s Adam.” In 2002, the pedestal under this statue gave way. The marble statue fell to the ground and broke into 28 big pieces and I don’t know how many little pieces. The restoration of the statue was documented and is now being shown, along with the beautifully restored statue, in its own little room (I can’t give you the exact location – just go towards Arms & Armor and ask one of the guards for directions). 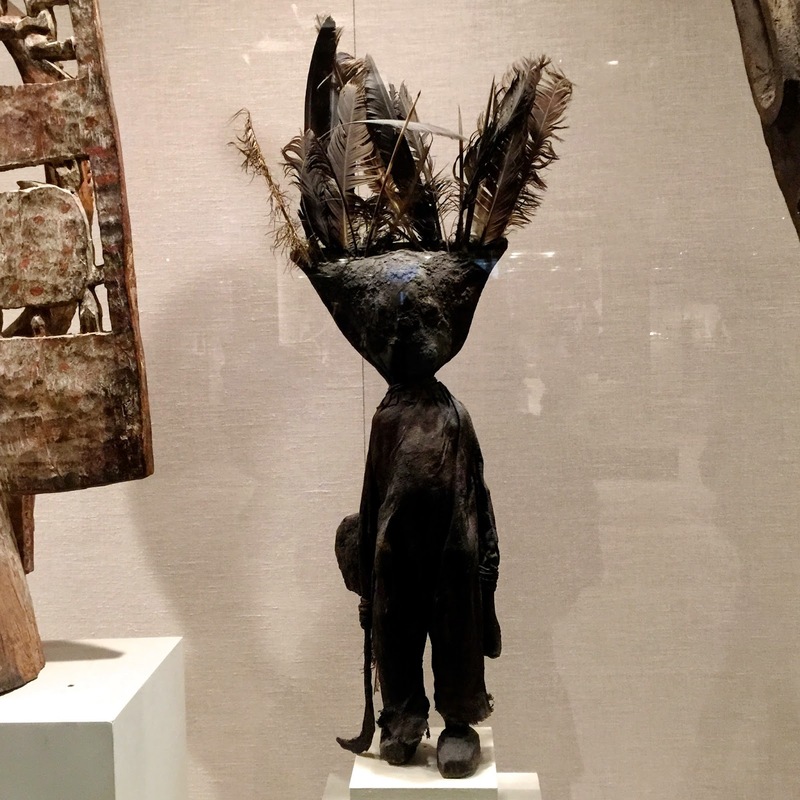 The thing about visiting The Met is that one can be easily overwhelmed by size of the museum and the sheer number of amazing things to see. I don’t even try to pay attention to every last item in there. Rather, I prefer to stroll through the galleries and stop when something catches my eye. Midway through our visit, Stacy pointed out that I was stopping at all the creepy stuff. 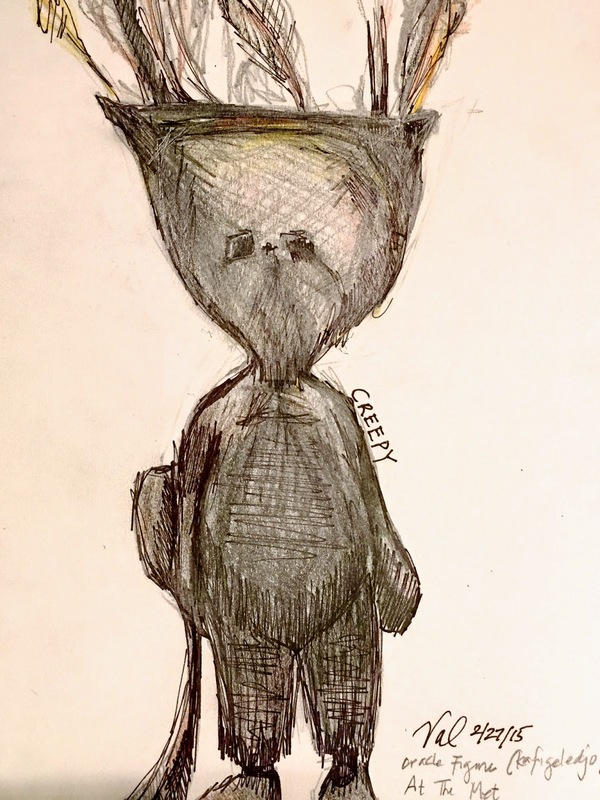 I drew Creepy Guy with more childlike proportions (bigger head, pudgier body). I’m toying with the idea of using a plastic baby doll (plenty creepy already) and then swathing it in layers of black fabrics. Hmmm… maybe. 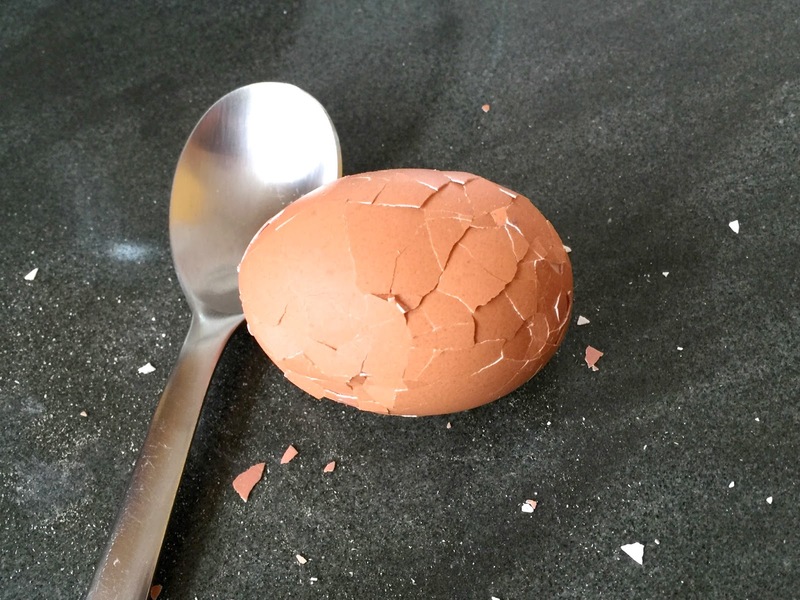 I know how to make tea eggs now. Hurray!! Hurray!! Do you think I’m waxing a little too enthusiastic over some boiled eggs? Maybe I am. But my boys & I love eating tea eggs. For years, we’ve practically brawled over the last tea egg every time we visit our favorite bubble tea house. I can’t believe it never occurred to me to just make a batch myself! Then a week ago, a friend dropped in to wish us a Happy Chinese New Year. She brought some tea eggs her aunt had prepared. It was a light bulb moment for me. 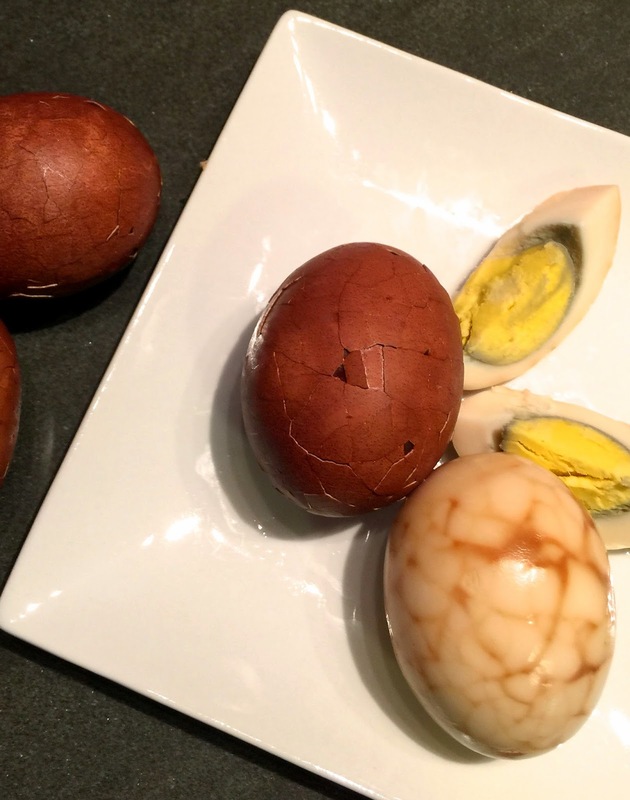 Shortly after inhaling our New Year’s tea eggs, I went online to find a recipe. 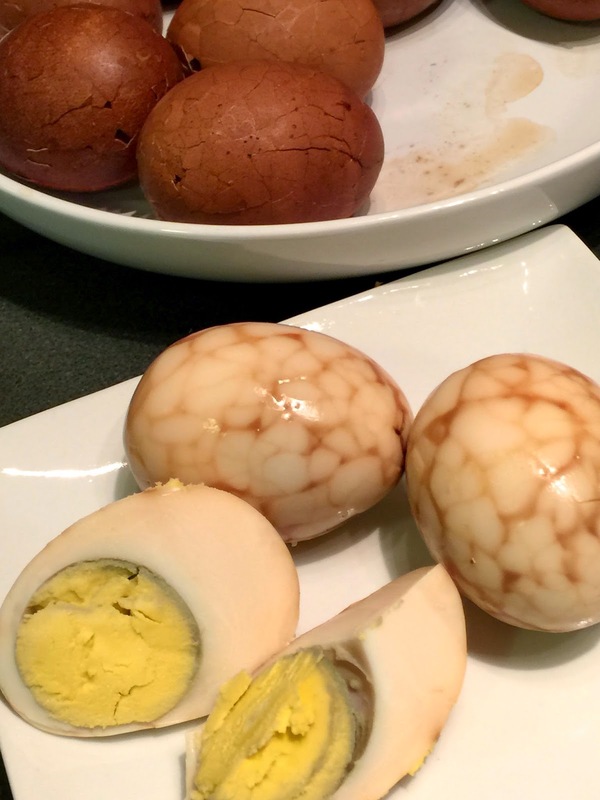 I found a beautiful tutorial on how to make tea eggs on Food52. 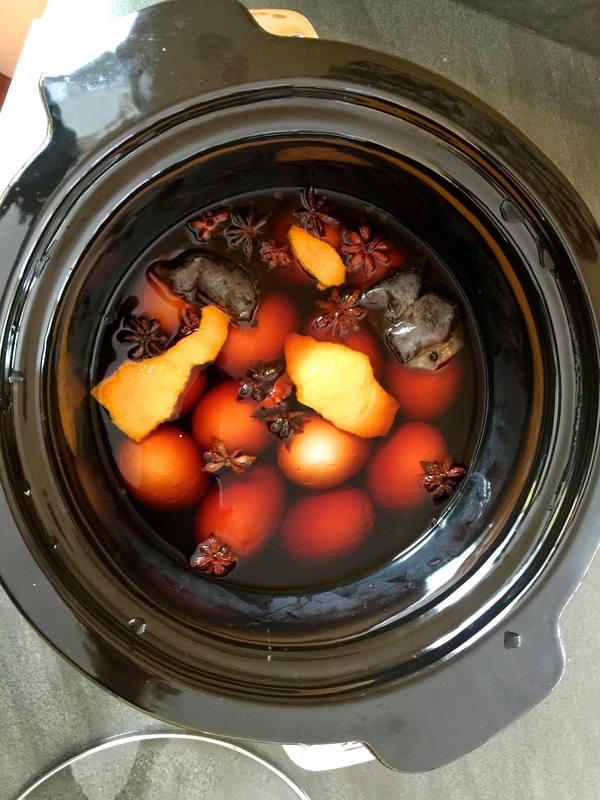 Thank you to Cynthia for the gorgeous pictures and recipe! Since I couldn’t be home while the eggs simmered in the yummy tea mixture, I deviated from Cynthia’s recipe by using a slow cooker instead. Once the eggs were soft boiled and cracked, I tossed everything into my slow cooker and set it to cook on low for 4 hours. Now bad, right? My kids loved them. Devoured them almost immediately. And are now asking me to make a second, bigger batch for them. Infuse the eggs with a little more color and flavor. I know it can be down because my friend’s Auntie achieved both. So it’s back to the kitchen with another dozen eggs to see if I can do better the second time around… let you know if I meet with success. Have you ever noticed how things around the house just start piling up? Kids’ school work and art projects. Birthday gifts. Christmas gifts. A few purchases here and there. Mail. Paperwork. Takeout containers. Stuff. Stuff. Stuff. Before you know it, you have way too much stuff. A few weeks ago, I shared about my goal to sort through my stuff and clear out 100 things. I’m happy to tell you I met that goal and continue to purge. It feels good, folks. Our apartment looks fresh & I feel like I have more physical and emotional space. My new goal is set at 150 “things” (a “thing” might be one item or one full bag of items). I’ve cleared our kitchen and living room of excess and have now moved onto the kid stuff. And to clean the kid stuff, I’ve pulled my boys into my cleaning game. It’s their stuff & I want to respect that. My 9 year old just pointed out that since I bought most of it, technically, it’s my stuff. But seriously, I want my boys to know that I respect their decisions about what is valuable to them and what they can let go. I want them to grow up to respect my things. Here’s a story to illustrate what I’m talking about. A friend of mine felt very frustrated that his elderly father’s household was furnished with shabby, outdated items. He first offered and then begged his father to let him replace everything. When his father repeatedly refused, he ordered new everything anyway. Then one day while his dad out, he arranged for movers to throw all his father’s furniture away and replace it with the new stuff… Think his father was pleased about how tidy and spiffy his home looked when he discovered the changes? I have no idea whether or not this particular father had showed respect for his son’s belongings when he was growing up. But I often wonder why grown children feel the right to make major decisions for their lucid, aging parents. Is it possible that the small action of purging a child’s belongings without that child’s knowledge and permission teaches a mutual lack of respect? They need to learn. If I didn’t step through the cleaning and sorting process with my kids, then they would simply tidy up by putting everything into piles. Yes, it takes much longer and is not as efficient when the boys work alongside me. But when we are finished, they know what questions to ask themselves when sorting, what they kept and what went to charity or trash. Toy Sale: This approach was more effective when the kids were younger (5-8 years old). Folks seem more likely to buy used preschool-age toys. And if the kids are trying to sell their own stuff, they’re still cute enough that they might get some pity sales from adults… To motivate the boys to round up their unwanted toys to sell, we would decide on one new big ticket item they wanted to purchase. Instead of me buying it for them, the three of us would work together to sell off their old toys to make enough money to buy the new one. We made a big deal out of decorating our money jar to store our toy sale earnings in. And celebrated in style when we met our earnings goal. “Ten Things” and the Halloween Toy Bucket: When the kids ask permission to watch TV or play a video game, I often ask them to first put away 10 things. Sometimes they cheat and put away 10 mini Lego pieces. But for the most part, they are honest about cleaning 10 things up. Sometimes, I ask them to contribute 10 items to our Halloween Toy Bucket. Come Halloween, we have a bin of little toy tchotchkes to put out next to that bowl of candy for the neighbor kids. Setting a One Box limit: If you’re in a house, you might have lots of storage space. But we’re in an NYC apartment and space comes at a premium. Much as I’d love to keep every last piece of school and artwork my kids bring home, there is simply not enough space. We are each allotted one large under-the-bed bin to save past art/schoolwork. During each school year, there is overflow into other baskets and bins around the house. But once a year, we sit down to determine which pieces still mean enough to us to keep and what we can give up to make it all fit into our box. Sorting day turns out to be pretty special. It’s fun to read over the boys’ past school work. We also reminisce over what we remember from art pieces they made when they were 3, 4, 5…. Taking It All Out and Then Putting Some Back In: When we’re cleaning out clothing and desk drawers, I sit with the boys. We empty the drawers. Clothing items are tried on. Outgrown pieces are placed in the donate pile. Things they still like and wear are put back in the drawers. Similarly, we assess everything in the desk drawers. It’s always amazing to me the bits little boys see fit to stow away as treasure. A Place for Everything: Everyone knows this one. So there’s not much more to add. But I do think it’s important the kids know exactly where items belong. Books on book shelves. Clothes in drawers or hung on hooks (hooks are easier for them than hangers). Labeled bins to group toys (Lego, Plastic Guys, TMNT, etc). School work in the school basket. Back packs in the out closet. Dirty clothes in the dirty clothes bin. And of course, toys to donate in the Halloween Toy Bucket. I’m following the “Big Cable Scarf” pattern by Jami Brynildson (available on Ravelry). 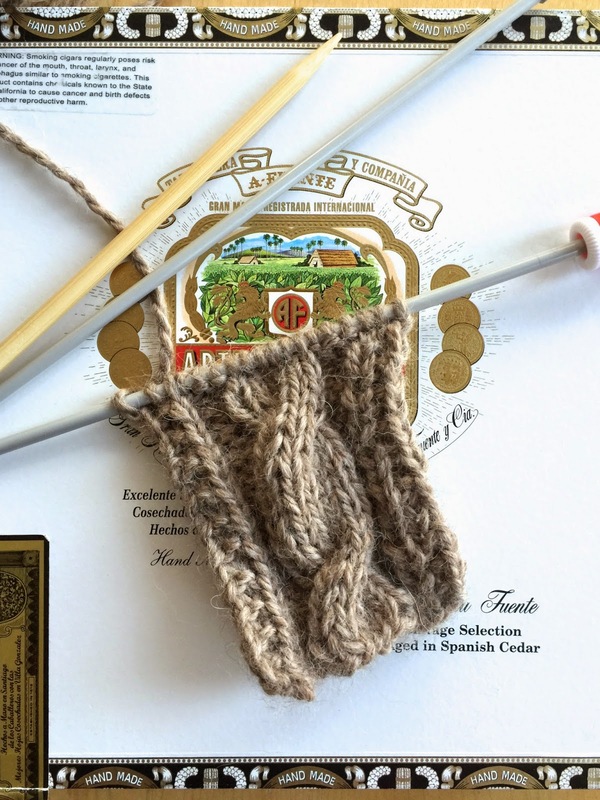 Using a worsted weight yarn and #8 needles instead of the suggested bulky wool and #17 needles. No where near wide enough to be a scarf. However, if all goes well, this practice cable may eventually become a headband. But for now? It’s back to practicing, counting and cabling. I call it “table art.” What am I talking about? You know – when you pick up the crayons set out at the restaurant and you start doodling all over that clean piece of paper spread out to protect the tablecloth and to provide a drawing surface for the kids. You’re at the table. And you’re making art. So, it’s “table art,” get it? The other night, I was prepping for my Valentine’s card making craft night. I didn’t want to spend the next morning scraping glue off the table so I layered the craft table with sheets of paper before everyone arrived. And once that big expanse of clean white paper was before me, I just had to sit down to do a little table art. I started with a lightly penciled heart. I had no crayons. 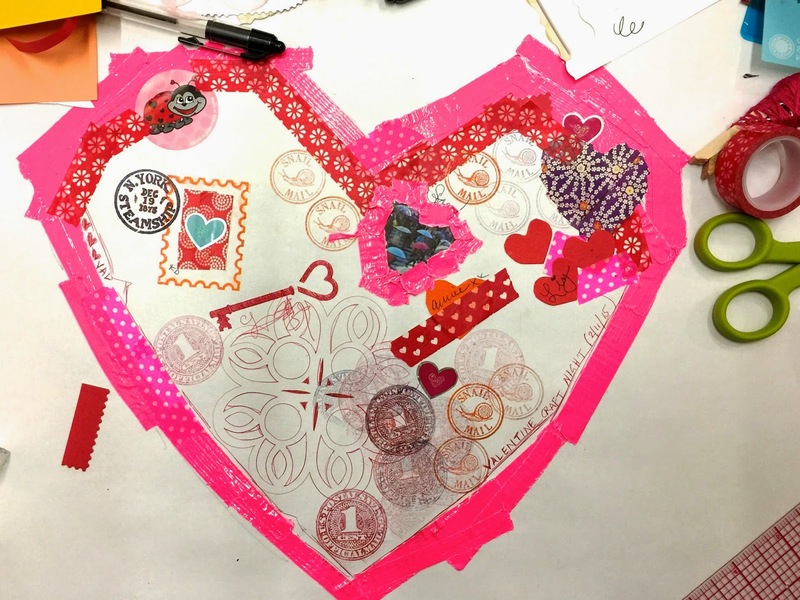 But the roll of bright pink duck tape worked just fine to frame out the heart. Then, between stitching and stamping cards, I took mini breaks to add to my heart doodle table art. Towards the end of our evening, I asked all my friends to contribute something to my heart and to sign their names so I could keep this bit of table art as a memento of the evening. Looking at this heart makes me really happy. Kris’s cool orange stamp with the turquoise heart punctuation. XiaoNing’s perfectly stenciled key. 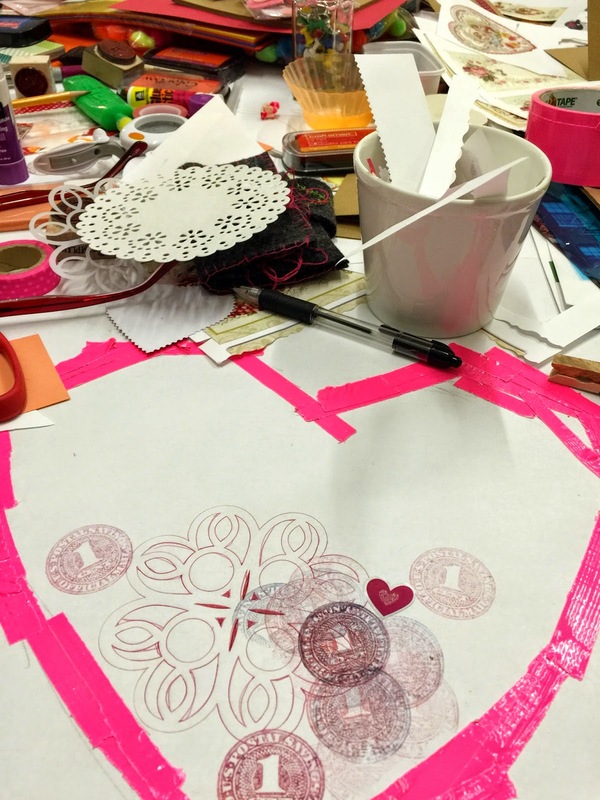 One of Stacy’s many cut out hearts surrounded by the bits of textured pink duck tape (so Stacy….). Annie, who with one swift gesture, left washi tape and signature on the page. She had this funny half smile on her face while she did it & I need to ask her what she was thinking. And Liz’s red hearts reminding me of all those ladybug cards she cranked out. Why is drawing on a random piece of paper taped to the table so inviting to me? Can I recreate that feeling and compulsion to draw, stamp, collage and write in a sketchbook? 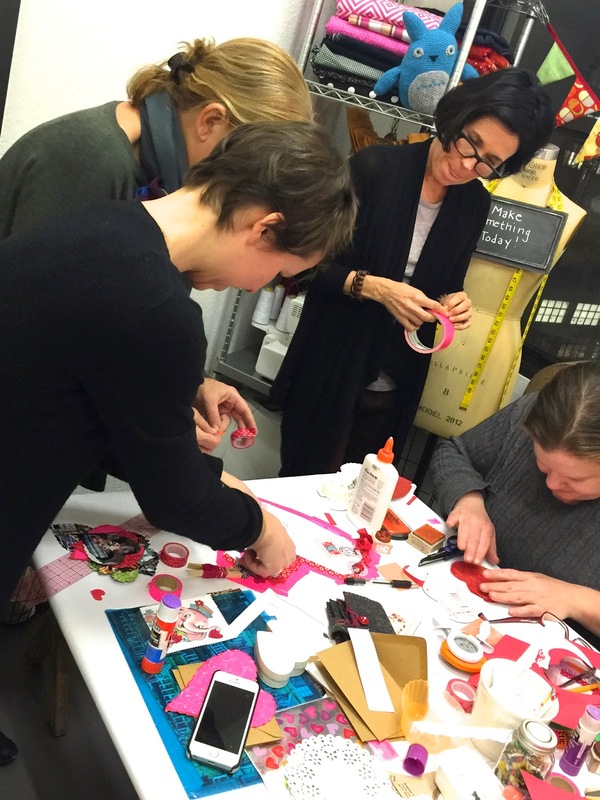 What would happen if I taped a fresh piece of paper to my crafting table each week? If anyone visiting the studio was invited to doodle a little bit? What could we make together?